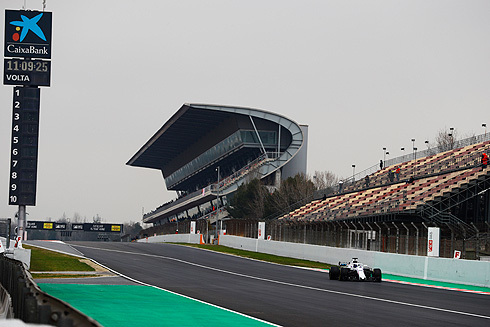 The Williams Martini team would complete their first day of testing for the 2018 Formula One season at the Barcelona circuit. It was a day that saw both Lance Stroll and Sergey Sirotkin run but only Lance was able to get any dry laps in as it rained in the afternoon session when Sergey was behind the wheel. The day for the team was more about system checks than performance with the team completing 74 laps in total. The opening day of testing for the Williams Martini team would see both team drivers running with Lance Stroll in the morning and Sergey Sirotkin in the afternoon. The morning session would see the team work through their checklist for day one which covered a large number of items, not surprising for the first day. Lance was able to complete forty six laps finishing the day in ninth. As for team-mate Sergey his run was hampered by rain that feel in the afternoon which saw his run on both the intermediate and full wet tyre. As such he was not able to set a representative time compared to those who had run in the dry. 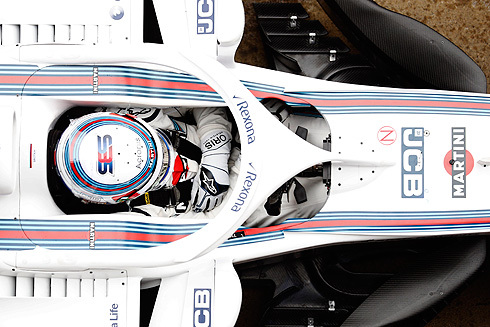 The team was able to come away with seventy four laps in total with no real issues with the FW41 which was an encouraging start for the Williams team. Paddy Lowe, Chief Technical Officer: Overall it was a good day. We had a bit of a cautious start as, despite having a filming day yesterday, we still had many parts of the car that we wanted to monitor. Lance got going properly around 11am, so had a couple of hours proper running before lunch and completed a total of 46 laps. We weren’t pushing too hard today as it was more about systems checks, but we are relatively happy with the car. Sergey took over driving duties for the afternoon. We did a number of aerodynamics tests in the early part of the session, but by time he was going out for proper runs we had lost track conditions as the temperatures plummeted. We weren’t alone in not being able to switch the tyres on; no matter how hard he pushed on the out-lap, the tyre was going away from him. It then began to rain, which did give us the opportunity to run the intermediate and extreme wet tyres, before ending the day with a practice start. So, it was a bit of a frustrating day for Sergey but overall, we have had very good reliability with a total of 74 laps on the car. We also have a lot of data to understand and build on our programme for the rest of the week. Thank you to all the team, both in Barcelona and back at Grove and Brixworth, for the incredible work they have done to get the FW41 here for its first day of testing. We hope this is the beginning of a strong season for the team. 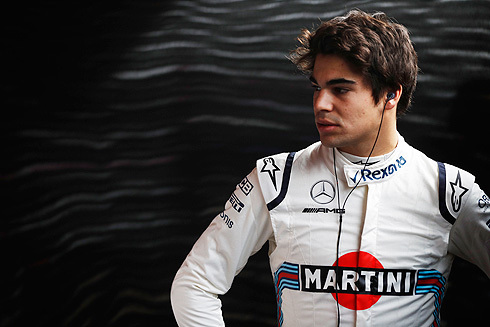 Lance Stroll: So far, so good, which is always a positive thing on the first day. It is a new car, which means there are lots of things that have to be done to get on top of it, so it is good we had no problems this morning. We have a big programme and we want to get a lot of laps done in order to get us as well prepared as possible for the first race. It is a bit early to say where we are, but it seems to be good so far. As for the halo, to be honest, I am not a huge fan of the look, however, it is going to help save lives. If I am in the car and it is going to help reduce the chances of being injured I will definitely take that device and that is what the halo is doing. I am complaining about the looks, but at the same time I understand that the safety is important. It is different for me here at this test as I have a year under my belt now. I am really looking forward to going into my second season of Formula One and having been to every track once, it is certainly different to where I was this time last year. Sergey Sirotkin: Today was a bit cold and rainy, unfortunately. We spent all day trying to make the best of the conditions but it was probably a little bit too extreme to run consistently. We tried different things throughout the day, but with the new surface which is nice and smooth, it’s not the best for such conditions. Due to the weather, I don’t think we could properly run or evaluate the car. Obviously, you want to maximise the pace to try and maintain the temperatures but that requires pushing as much as you can. I tried my best but we don’t want to damage the car at this early stage, and there were some tricky moments during the day. For sure, I was excited. It’s been a lot of work, we’ve been working very hard over the winter so it was very nice to be back here to try and put all the work we’ve done over the past few months onto the track in the car. We still have seven days of testing so I hope we’ll get some clear running and get some more chances to try the car properly. The halo is good, to be honest we’re quite used to it after running with it in the simulator. It’s definitely more difficult to jump in and jump out of the car but once you’re in it, you don’t care. The FW41 returns to the track tomorrow with Sergey driving in the morning session, before handing over to Robert Kubica in the afternoon.